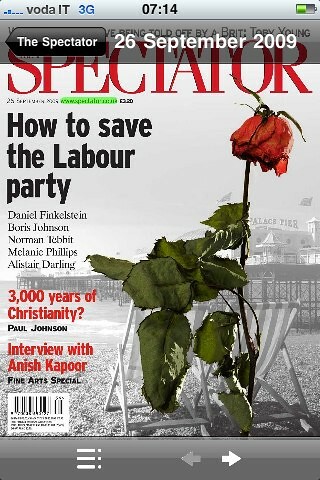 The Spectator now has a branded App, http://bit.ly/iphonespectator, in the iTunes App Store. This App gives users access to the complete magazine on the iPhone. The App is launched at the highly competitive price of 99c (59p, or €0.79). This buys a 7 day subscription to the magazine, and provides access to over 200 back issues. When the sub expires the purchaser has the option to renew for 7 days, or 30 days. The whole magazine can be viewed rapidly and attractively in PageFlow mode (this analogous to CoverFlow for a collection of CD covers on the iPhone/iPod Touch). PageFlow is a very easy way of browsing the magazine and gives the user a clear sense of ‘where’ in the publication she may be. Note, also, that this is the magazine exactly as it was printed. Every phone number in the magazine is a live phone number, and when clicked (and confirmed) the number will be called. 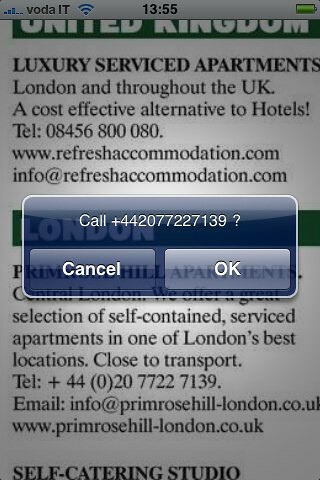 The App works just as well on the iPod Touch, but clearly this click-to-call function will not work on an iTouch! The magazine appears on the iPhone exactly as it was printed, but with crucial additional functionality through the live links. In addition to the phone numbers, page numbers are navigation links (within the text and from the Table of Contents). Email addresses, url’s, and postcodes are also live links to other Apps on the iPhone (its browser and the Google maps App which are fired up as required). Apple’s App Store is a way of selling subscriptions to publications. Publishers of books, magazines, and newspapers can now offer their valuable content for subscription to iPhone/iPod Touch users. The iPhone is a compelling platform for mobile consumers, and for that reason it will become a fabulous platform for publishers. €€€ £££ $$$ ! 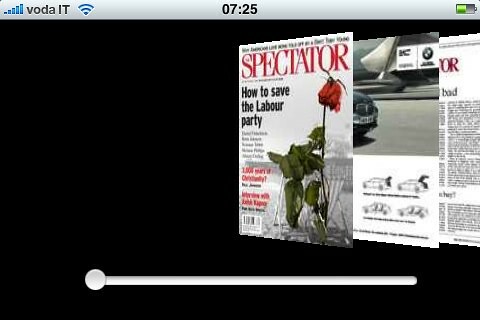 The Spectator is not the first magazine to be sold on subscription through the iPhone platform. That record fell to Athletics Weekly but The Spectator has launched its subscription offer on the iPhone shortly after moving to a ‘paid for’ approach to its web distribution. Many other magazine and newspaper publishers are considering their options in this respect so the The Spectator’s experience of moving to a ‘charged’ model will be studied with interest. We have a slideshow at Flickr of images from the iPhone App. We also have a short YouTube video showcasing some of the interface in the platform. Is the edition downloaded to the iphone (and therefore available offline)? Or does the user require constant connection to browse between pages? The application downloads the pages as needed, so the user needs to have a connection to read the magazine. We don't require wifi – Edge is good enough, but of course a bit slower.